Last week, a construction crew was digging. This was part of work on a new fire and police building in Thornton, Colorado. They unearthed a prehistoric treasure. I was an ancient triceratops fossil. “I’m over the moon right now about this dinosaur fossil," said Joe Sertich. He's paleontologist of the Denver Museum of Nature & Science. Thornton officials brought Sertich in earlier this week. They had him confirm the discovery and begin the work to excavate it. He hopes to see the fossil exhibited in his museum once it's dug up and preserved. 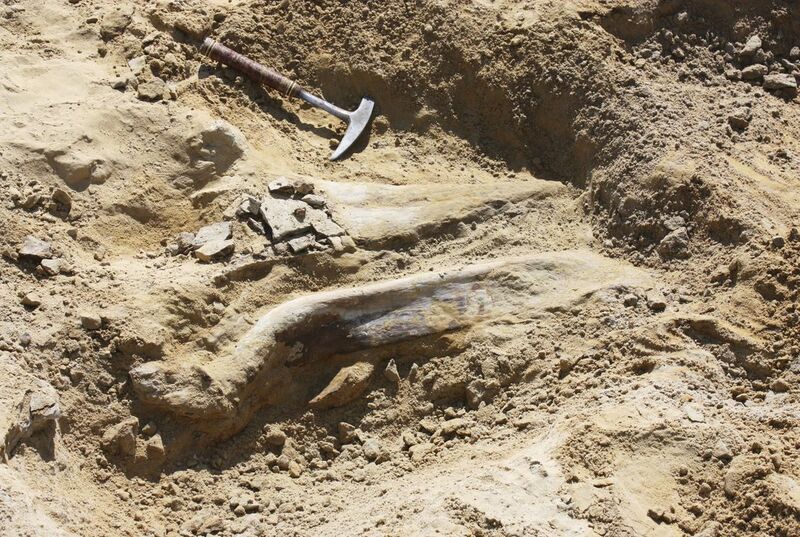 The remains are older than most other fossils found along the Front Range. Those usually originate from the end of the last ice age. That was around 10 to 12 thousand years ago. The triceratops dates back to at least 66 million years ago. That's when the creatures are thought to have gone extinct. That happened after a six-mile wide asteroid collided with Earth. The Front Range is a densely populated and heavily paved metropolitan area. People rarely dig far enough down to reach some of these older layers that contain dinosaur fossils. And when they do, they often are just plowed right over. Triceratops have long captured the imagination of dinosaur lovers. The first skeleton was assembled and mounted in an exhibit at the Smithsonian's National Museum of Natural History in 1905. It was named "Hatcher." This was in honor of pioneering paleontologist John Bell Hatcher. He discovered most of its bones. The beast was cobbled together from a patchwork of parts. It was hardly anatomically accurate, but it was still awe-inspiring to visitors. The Washington Post called it "the most fantastic and grotesque of all that race of giant lizards known as dinosaurs," writes Sarah Kaplan of The Washington Post. It was in an article describing a forthcoming exhibit that included "Hatcher." Triceratops was among the last living dinosaur species. This large, herbivorous dinosaur sported two horns on its forehead and one at the tip of its snout. Its name literally means "three-horned face.” Through the years, triceratops have become famous in pop culture, making appearances in films including "Jurassic Park" and "The Land Before Time." It has even made its way onto postage stamps. 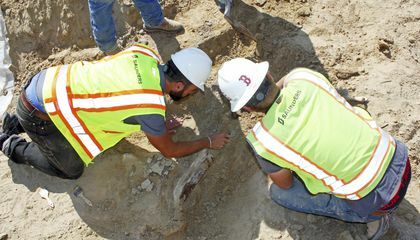 i think its cool that the crew found a 66 million year old fossil. It would hit the ground to cause an earthquake witch cause the weather to change, hurricanes to form. trees flying less food for the plant eaters witch mean no food for the meat eaters witch led to extinction. An asteroid may have caused extinction by stopping the growth of plants. The impact of a giant space rock would cause large clouds of dust and smoke to fill the atmosphere. The darkened sky would prevent the passage of light through the atmosphere. Without light, plants can not photosynthesize and the herbivores would die out from the lack of food. The higher trophic levels would follow suit and the dinosaurs would go extinct. I thinks its really cool they found these bones. Being that the bones are so old is really cool that they found them. This is so cool! I think that its cool that we are still finding dinosaur fossils today!! How did an asteroid cause the dinosaurs'extinction?The asteroid caused the dinosaurs to go extinct because of how big/long it was (6 miles).So once it hit it could have started a fire or it have contaminated the air.once the air is contaminated you don't either have enough air to breathe or it is not good air to breathe and the die one by one. Finding a dinosaur fossil is pretty cool since they lived a while ago. I think using the direction the dinosaur was heading in could help a paleontologist see how the dinosaur was thinking, or what he did to run from whatever was a threat like did he try to hide or unfortunately did it just die out. The asteroid hit 65 million years ago, so I think it got killed by something.